Double up on the sparkle. 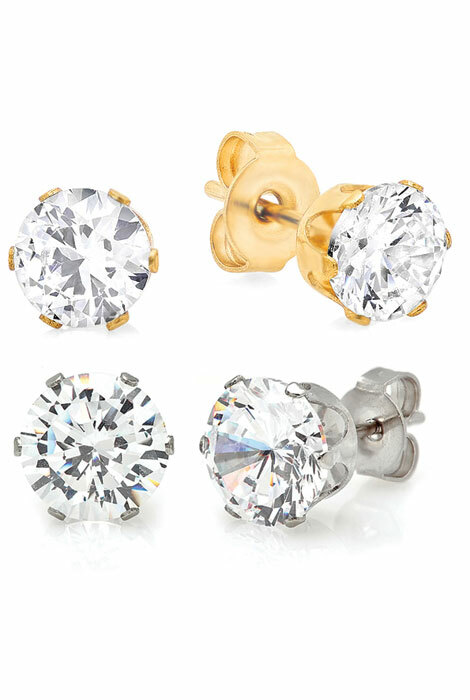 Essential CZ stud earrings come in a set of 2 pair, perfect for double-pierced ears or keeping an extra pair on hand. Made of stainless steel, a quality choice in jewelry design because of its beautifully polished finish, durability, and resistance to rust, oxidation and discoloration, even in humidity. Includes a pair of silvertone and a pair of 18k gold-plated steel to complement any wardrobe. Polish cubic zirconia earrings with a soft, dry cloth. Allow 2–3 weeks for delivery.